Cake Pop Maker for $1.99! This week's Tuesdays with Dorie (TWD) recipe was chosen by Laurie (founder of TWD!) of Slush: Unbelievably Good Chocolate Blueberry Ice Cream. I thought I had everything I needed for this recipe because we usually keep frozen blueberries on hand for my daughter, but when I went to the make the recipe I realized that the recipe calls for blueberry preserves, not fresh/frozen blueberries! Well, I just so happened to receive some Pomegranate Jelly for my birthday in November, so I decided to puree some frozen blueberries (about 1 tbsp) and mixed it together with the Pomegranate Jelly.... resulting in the most delicious chocolate blueberry pomegranate ice cream! If you would like the recipe, you can find here. 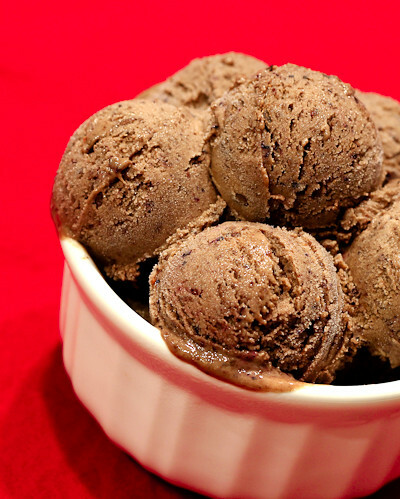 Make sure you also check out this page, too, so you can see what everyone else thought of this unusual chocolate ice cream! And if you haven't already, don't forget to enter my Peeled Snacks Giveaway! Ciao ! Nice invention ! Have to make this one ! I didn't have a chance to make this one this week, but it seems like everyone really enjoyed it so maybe I'll do it for the rewind next week :) Your blueberry pomegranate combo sounds awesome! chocolate and blueberries seems like a random and completely awesome combination!